Congratulations to Brad Widdup and Jadeske Racing on 3yo filly Wonderbabe (Snitzel - Alices Smart (USA)) winning impressively at Randwick today over 1100m for jockey Christian Reith. The filly was purchased for $400000 at the 2017 Inglis Easter Yearling Sale and looks to have a very bright future ahead of her. Sizzling made his mark on Caulfield Cup Day with promising filly Zizzis winning the opening race on the program and Sizzleme gaining Black Type with a brave third in the Group III MRC Ethereal Stakes. The Patrick Payne strained Zizzis led all the way and stuck to her guns to win the 1400 metre contest by a short half head. 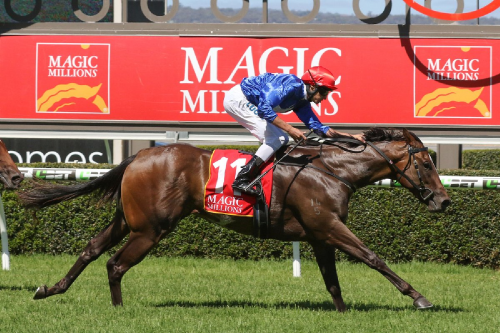 Zizzis is now Gold Coast bound for the Magic Millions Guineas after her all-the-way victory at Caulfieldwith managing part-owner Joe O'Neill outlining plans for the $120,000 Magic Millions purchase after her victory. Before a trip north, Zizzis has a date during Melbourne Cup week in a bid to gain black type for her breeding page. O'Neill has the Listed Jim Beam Black Stakes in mind for Zizzis. "I won it a few years ago with Hijack Hussy, which was the race before the Melbourne Cup," O'Neill said. "It's the race we've got in mind again and then we can back off and head to the Magic Millions for the Guineas.
" 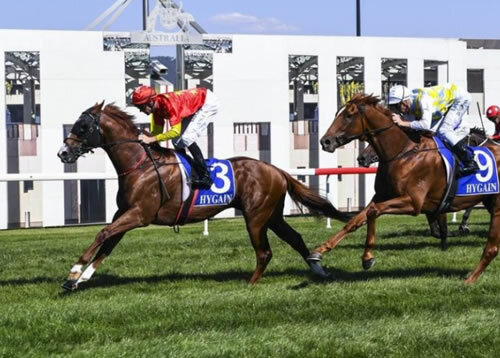 Zizzis won the $200,000 Magic Millions Adelaide 2YO Classic at Morphettville earlier this year and has the overall record of three wins from six starts with prizemoney in excess of $223,000. A $120,000 Magic Millions purchase for Prime Thoroughbreds from the Edinburgh Park draft, Zizzis is the third winner from Senro Kisaki, who produced a full brother to Zizzis last month. 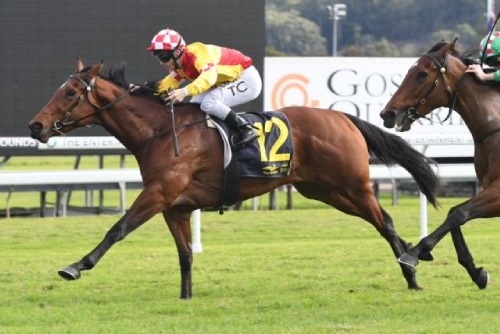 Stakes-placed last season at two, the Cindy Alderson trained Sizzleme has been racing well this spring finishing fourth in the $60,000 VRC Kennedy Oaks Trial and then third last Saturday in the Group III MRC Ethereal Stakes behind Oaks favourite Verry Elleegant. From a daughter of Zabeel in Parnissius, Sizzleme is entered for the Group I VRC Oaks and was brave in her first attempt at 2000 metres in the Ethereal, so she might be well placed in a race like the Group II VRC Wakeful Stakes at Flemington. Sizzleme and Zizzis are among seven winners this season for Newgate Farm's Sizzling, who is third on the Australian Second Season Sires List by earnings. The Group I winning son of Snitzel stands at a fee of $16,500. The powerful Darren Weir stable spreads it runners right around Victoria and produced an impressive three year-old Snitzel winner on Tuesday at Mildura. A full sister to Group III placed filly Spoils, Interram took plenty of benefit from her debut third at Kilmore earlier this month and was sent to the post a short priced favourite for the 1200 metre maiden. She quickly found the front and led all the way for Dean Yendall, slipping away down the running to win by four lengths under her own steam. 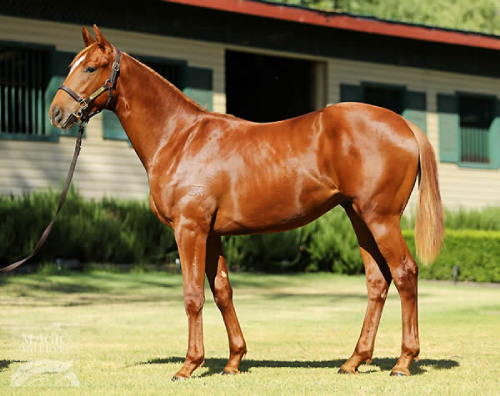 A $420,000 Magic Millions purchase from the Edinburgh Park draft for Little Kwok Hing Hung/Bahen Bloodstock, Interram runs for Orbis Bloodstock. Bred by Ian Smith, Interram is the second winner from stakes-placed General Nediym mare Fortune of War, a daughter of exceptional producer Pretty Penny. A Group III placed daughter of Encosta de Lago, Pretty Penny has had six named foals and all are stakes performers headed by $1.2 million earner and Group II winner Sertorius and current Group III winner Dollar for Dollar, who was a close second in the Group I Sir Rupert Clarke Stakes last Saturday. Given the ability of her family it will be no surprise to see Interram given a shot at Black Type races during the spring. 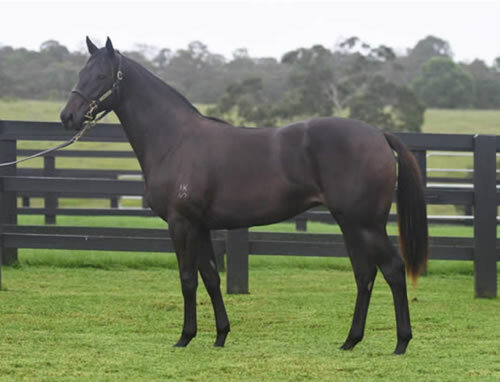 Pierro gave us a well bred debut winner at Pakenham on Tuesday and as we've seen in the past with the Golden Slipper winning son of Lonhro, a promising winner for him at this time of year can go far. Trained by Robbie Griffiths, three year-old filly Absolemm was a short priced favourite for the 1000 metre maiden and won accordingly. Only fair to begin, she mustered speed soon after and moved up to be fourth three wide for much of the trip, before powering clear to win by a length and a half. 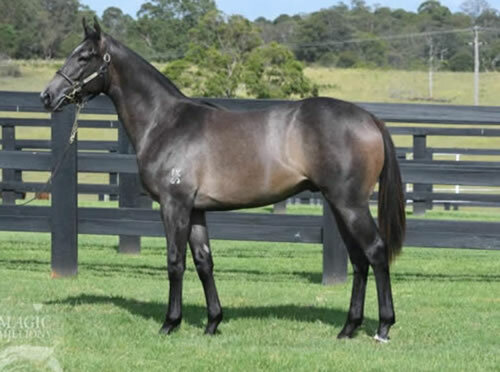 A $200,000 Inglis Easter purchase for Griffths Racing / Peter Ford Thoroughbreds (FBAA) from the Edinburgh Park draft, Absolemm was bred by Ian Smith and runs for Echo Beach Bloodstock. She is the first winner for nicely bred import Nothin but a Dream (USA), a grand-daughter of influential stakes-winner Adarling. If that names sounds familiar it's because Adarling is the grand-dam of celebrated stakes-winning producer Mica's Pride, the dam of Group I winners Criterion and Comin' Through, who have won $9million between them! Adarling is also the grand-dam of Rose of Cimmaron, the dam of last Saturday's Epsom Handicap bound stakes-winner Siege of Quebec and his Group III winning full brother Bull Point, who stands at Kingstar Farm. Given the strength of this female family it's no wonder the Snitzel yearling filly from Nothin but a Dream made $400,000 at Inglis Easter this year for Edinburgh Park when knocked down to John O'Shea Racing. Nothin but a Dream has a yearling colt by Fastnet Rock and will foal again to the champion sire this spring. Newgate Farm's flashy grey shuttler The Factor (USA) is not coming to the Hunter Valley this spring, but he did feature at Sandown on Wednesday with an impressive winner carrying the Spendthrift Australia colours. Handsome grey three year-old colt Fun Fact blitzed his older rivals to race away and win as he pleased over 1600 metres. Prepared by Gai Waterhouse and Adrian Bott, Fun Fact was a maiden winner at Newcastle in July, but has thrived since being sent to Melbourne and this was his second win from his past three starts in Melbourne. Already a winner of nearly $70,000, Fun Fact looks to have more wins in store. A $240,000 Magic Millions purchase from the Edinburgh Park draft for Spendthrift Australia, Fun Fact was the most expensive yearling from the first Australian crop of The Factor. He is the second winner from stakes-winning Dane Shadow mare Fill the Page. Wimlah (2yo filly Sebring-Caiguna) is a full sister to the very talented Serena Bay. On the day that Serena Bay retired her full sister has stepped up and saluted on debut against the older horses. From an outside barrier Tim Clark used the fillys early speed to cross the field and with a hint of arrogance she kicked well in the straight and was extending her margin on the line. She will now be given the opportunity to race against better opposition in the coming months. Congratulations to Adrian, Gai and all the owners. Wimlah winning impressively at Gosford on debut. For a vendor approaching a major yearling sale it's often said you are only as good as your last winner and in the case of Edinburgh Park, those winners are two pretty smart horses!. Respected breeder Ian Smith has established a winning formula at his thoroughbred nursery on the rich alluvial river flats of the Manning River just minutes from Wingham, on the NSW Mid North Coast. 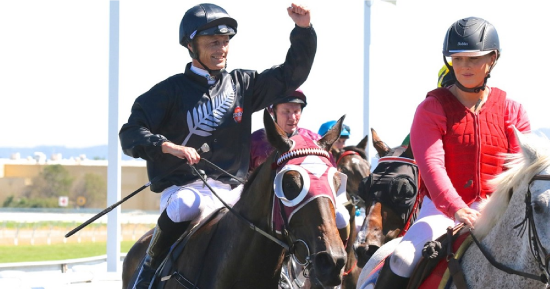 The Edinburgh Park brand is renowned for success and what world champion sprinter Silent Witness started back in 2003 has now become a steady stream of stakes horses with the latest star performers being Assimilate and Zizzis. A consistent program of improving and updating the Edinburgh Park broodmare band combined with astute matings utilizing the best stallion talent in the country has led to ongoing success. 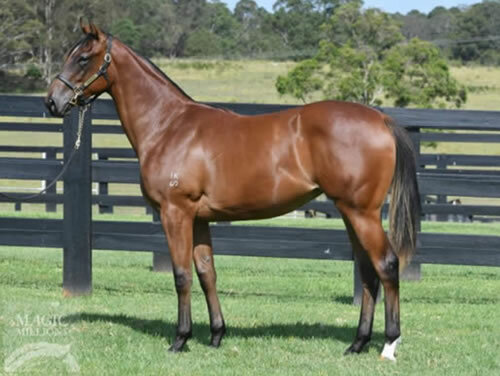 Bred and offered for sale by Edinburgh Park at the 2016 Inglis Australian Easter Yearling Sale, Sebring colt Assimilate caught the eye of the stallion makers and was knocked down to China Horse Club / WinStar Farm for $420,000.. Sent to Peter and Paul Snowden, he won his first two starts as a two year-old before finishing second to Addictive Nature in the Group III ATC Ming Dynasty Stakes and fifth in Trapeze Artist's Group I ATC Golden Rose Stakes during the spring. Last Sunday, Assimilate confirmed his stakes potential with a barnstorming win in the Listed Canberra Guineas over 1400 metres. 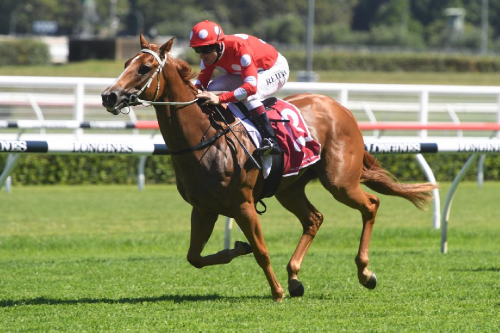 Newgate Farm's Henry Field, a part-owner of the striking chestnut, said the son of Sebring is up to winning a good race in Sydney over the carnival. "The horse has got talent. He finished fifth in the Golden Rose and Paul and Peter have always had a good opinion of him," Field told Sky Racing. "He's a beautiful horse with a great pedigree and it was a wonderful ride by Tye (Angland). "We will find a nice race through the (Sydney) carnival for him." Assimilate is the second foal and second winner for stakes-winning Commands mare Jester's Girl, who was covered again by Sebring last spring. 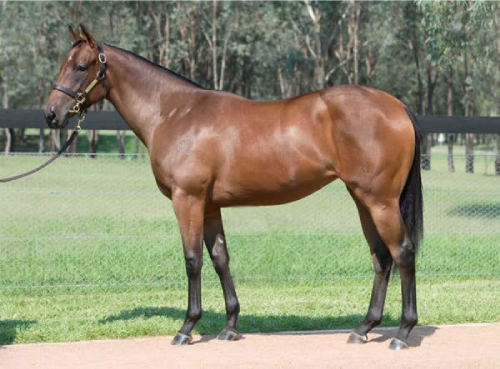 Also bred and sold by Edinburgh Park is Sizzling filly Zizzis, who made it two wins in as many starts when taking out the $200,000 Magic Millions 2YO Classic at Morphettville on Monday. Prepared by Patrick Payne for a big team of Prime Thoroughbreds owners, Zizzis scored a bold front running debut win at Bendigo last month giving connections the confidence to send her to Adelaide for this lucrative sales incentive race. In a competitive field of 14 featuring two time stakes-winner Nomothaj, Zizzis proved much the best, powering clear under Billy Egan to score a dominant victory in the 1200 metre dash. "We were really happy with her first up win and thought she had come on well since then," said Payne. "We love the Sizzling breed, they are very sensible and make good racehorses. They just want to please you. "We'll take her home now and see how she pulls up before working out where we go next." A $120,000 Magic Millions purchase for Prime Thoroughbreds from the Edinburgh Park draft, Zizzis has already won nearly $150,000 and is the third winner from Senro Kisaki, who was covered again by Sizzling last spring. Edinburgh Park have three entries for the 2018 Inglis Australian Easter Yearling Sale, all lovely fillies by Choisir, Sebring and Snitzel. Click here to see the draft. 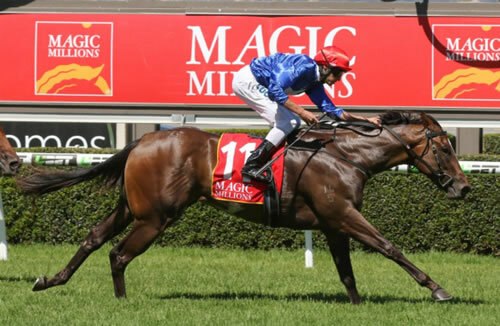 Exciting filly Zizzis could head to Sydney after she extended her unbeaten run with a stylish win in today's $200,000 Magic Millions Adelaide 2YO Classic (1200m) at Morphettville. An all the way winner at Bendigo at her only previous run, Zizzis appreciated being ridden off the speed and produced a great turn of foot in the straight to win and continue an incredible Magic Millions run for Prime Thoroughbreds. Winning trainer Patrick Payne said the filly had always shown good ability and looked to have a bright future ahead. "She's got a great attitude,"Payne said of the Sizzling filly. "She's a real professional - she really wants to please you." 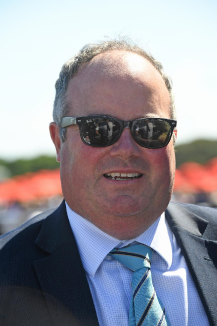 "We led on her at Bendigo and we didn't think it was the right thing to do, so we decided to take a sit (today) to get the 1200 metres and she did the job beautifully." Payne added. Zizzis was purchased by Prime Thoroughbreds from breeder Edinburgh Park at last year's Gold Coast Yearling Sale for $120,000. She is the eighth Magic Millions feature race winner to be syndicated by Joe O'Neill. "In the last five years I've bought my trainers in Victoria and Tasmania 10 yearlings that have raced for nine winners and they've won five Magic Millions races," O'Neill said. "We love Magic Millions, they've been very good to us over the years. We have really embraced the Magic Millions concept and we set our horses for the Magic Millions races and we win them." "She's a beauty this filly. I had her sister in Tasmania and she hurt herself. The half brother won five races in Hong Kong last season." "I'll talk to Patrick Payne but I wouldn't mind taking her to Sydney - there's a 1200 metre fillies race on the week after the Doncaster. I think we might take her up there and shake up the New South Welshman a bit," O'Neill added. Popular Victorian jockey Billy Egan was all smiles after the race - delighted to have captured South Australia's richest juvenile race. Meanwhile, local rising sprint star It's Been a Battle scored the biggest win of her short career when she led throughout to win the listed Matrice Stakes (1200m) later in the afternoon. At her first run since winning on December 30 last year, It's Been a Battle showed great fight to hold off a determined challenge from proven stakes winner Stellar Collision. A six time winner from just 10 starts, It's Been a Battle is turning out an incredible money spinner for trainer Shane Oxlade who purchased her for $16,000 at the 2015 Magic Millions Adelaide Yearling Sale from the draft of Glenlee. It's been a good weekend for the Oxlade stable with It’s Been a Battle's stablemate Robocop winning on the Parks track at Morphettville on Saturday. "If you can't enjoy winning your races there's something wrong," an emotional Shane Oxlade said after the race. "This is why you get out bed at half past three every morning." "I've waited a long time to get one as good as this one goes. And it does go good. ""She's a really nice horse," Oxlade said of the daughter of Nicconi. "I'm really happy, so happy!" Today's meeting provided the perfect launch pad to the 2018 Magic Millions Adelaide Yearling Sale which commences at the Morphettville Sales Complex at 10am (SA time) tomorrow (Tuesday). Just a day after Sizzling Belle ran the race of her life for a brave second in the Group III Black Opal Stakes in Canberra, her sire Sizzling was back in the frame in another juvenile feature with unbeaten filly Zizzis taking out the $200,000 Magic Millions Adelaide 2YO Classic at Morphettville. In a competitive field of 14 featuring two time stakes-winner Nomothaj as favoruite, Zizzis proved much the best, powering clear under Billy Egan to score a dominant victory in the 1200 metre dash. "She's a real professional," said Billy Egan, who also won on the filly at Bendigo. "She's a credit to Paddy and his team.
" Zizzis has now banked nearly $150,000 in winning her first two starts. 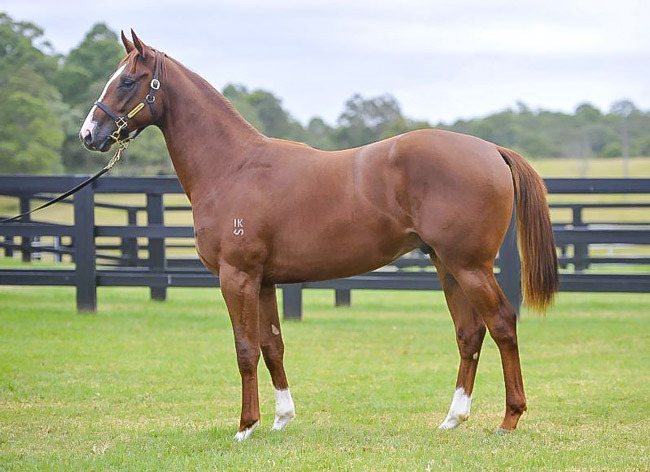 A $120,000 Magic Millions purchase for Prime Thoroughbreds from the Edinburgh Park draft, Zizzis is the third winner from Senro Kisaki, who was covered again by Sizzling last spring. Prime Thoroughbreds snapped up the current yearling from Senro Kisaki at the 2018 Inglis Classic Yearling Sale paying $85,000 for her filly by Rubick. Bred and offered for sale by Edinburgh Park's Ian Smith, Zizzis is one of four winners for Snitzel's Group I winning son Sizzling, who has three entries for the Magic Millions Adelaide Yearling Sale and a further seven for the Magic Millions Gold Coast March Yearling Sale next month. A solid pace in Sunday's Listed Canberra Guineas allowed two Sebring colts to come from the tail of the field to fight out the finish. To the cheers of the punters, the heavily backed favourite Assimilate charge home from second last on the turn to defeat Primitivo by three-quarters of a length with Waimea Bay (All Too Hard) a length back in third. A winner at Kembla Grange and Randwick, the Peter and Paul Snowden trained colt looked on target for a major race when second to Addictive Nature in the Group III Ming Dynasty Stakes at Rosehill Gardens before finishing fifth in Trapeze Artist's Group 1 Golden Rose Stakes. He has not been disgraced at his last two starts in Group company in Sydney. Carrying the colours of The China Race Club, Assimilate advanced his record to 3 wins and 1 second from 7 starts with earnings of $230,750. "He's a beautiful horse with a great pedigree and it was a wonderful ride by Tye. 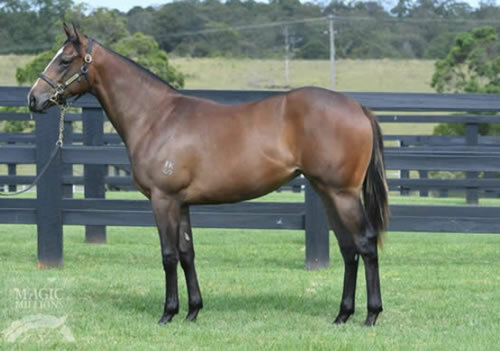 A $420,000 purchase for China Horse Club / WinStar from the Edinburgh Park draft at the 2016 Inglis Australian Easter Yearling Sale, Assimilate (pictured as a yearling) is the second foal of the stakes-winning Commands mare Jester's Girl a daughter of the Listed winner and Group 1 Golden Slipper and Magic Millions 2yo Classic runner-up How Funny (Rory's Jester). Paul Moroney Bloodstock went to $260,000 to secure Jester's Girl's yearling colt by Zoustar at the 2017 Magic Millions. After missing to Sebring in 2016, Jester's Girl visited the outstanding Widden stallion again last year. Assimilate becomes the 37th stakes winner for Sebring who covered 204 mares last spring at a fee of $66,000. Newgate Farm's Sizzling added another winner to his tally when two year-old filly Zizzis showed brilliant speed to lead all the way and win a competitive maiden at Bendigo on Thursday. Sizzling Trained by Patrick Payne for Prime Thoroughbreds, Zizzis was well backed and showed plenty of natural speed and a tenacious will to win at the finish to score by a long neck. 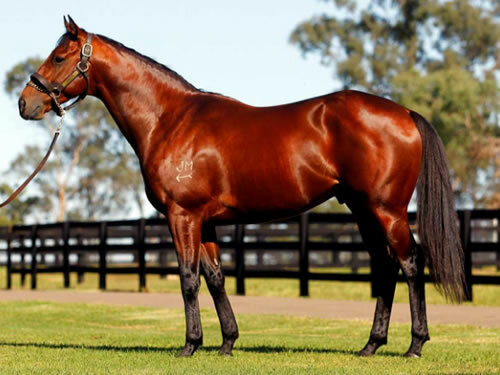 Zizzis is the fourth winner for Snitzel's Group I winning son Sizzling, who covered 116 mares last spring. By Glenn Davis Promising youngster Only Wanna Sing upset a sensational plunge on Toowoomba debutante Red Stina with the narrowest of wins at Doomben on Saturday. Only Wanna Sing got the bob in on the line on the heavy track to edge out the fast finishing Red Stina by a nose in the QTIS Two-Year-Old Handicap (1100m). Trainer Rob Heathcote narrowly missed the quinella when Pinch Memory faded late to finish third, a further three-quarters of a length away. The Red Lipp-trained Red Stina was heavily backed midweek with reports some punters snared as much as $69 before eventually starting at $8. 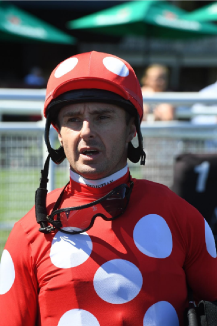 The Red Dazzler filly stormed home out wide and looked set to win before jockey Damian Browne got the best out of Only Wanna Sing in the last few bounds. Heathcote was full of praise for Browne"s ride which brought back memories of the great partnership the pair shared with former star sprinter, Buffering. "It was desperately close and it was a great ride from Damian," Heathcote said. "I think it was Damian's ride which won the race as he got the best out of him on the line." Only Wanna Sing was a $30,000 buy as a yearling and was having his first start since finishing fifth on a heavy track at Doomben last November. He previously ran second to Tony Gollan's Golden Slipper hopeful Ef Troop in his Doomben debut. The son of Your Song went into the race with a barrier trial at Doomben earlier this month which gave Heathcote the confidence of a strong first-up performance. "I don't think it was the wet track that beat him last start - it was only his first preparation," Heathcote said. Heathcote also was pleased with the run of Pinch Memory who looked the winner half way down the straight before fading late. "I liked his (Pinch Memory's) run," Heathcote said. "I think both of them are winter carnivals horses so we'll look at the winter carnival program now." Browne believes Only Wanna Sing has a bright future and expected further improvement from the youngster. "He's a lovely horse and Rob has always had a good opinion of him," Browne said. "He's still a little green but he got to the line strongly."